Super Mario Odyssey Release Date, Gameplay, Features, Clips, Trailer, News, Updates: Guys and girls be ready to feel nostalgic again. The video game which has made 90’s children’s childhood memorable is coming back again. After the launch of Super Mario Galaxy 2, this void was tough to fill. But our fun is back. Now, Super MarioOdyssey has been announced coming with all changes. It is giving the Mushroom Kingdoms a modern twist with the very different environment and mechanics. 1 What is Super Mario Odyssey? 3 Super Mario Odyssey Release Date: When is it coming out? 5 Super Mario Odyssey Platform: What can I play it on? SMO is produced by Yoshiaki Koizumi who is also the director of Super Mario Sunshine and Super Mario Galaxy. And after this two big and successful project, Odyssey seems to be the next major 3D Mario adventure blockbuster which is developed by the Nintendo. As revealed in the Nintendo Switch press conference, this game is specially developed for the platform. Kitting out Mario is inculcating all new skills and abilities like a weaponized hat that can be used as a platform. One of the most surprised things of all these is New Donk City. This city is full of yellow taxis, and it is for the first time almost normal looking humans we are going to see in Mario game. This new feature may disappoint some fans but can be interesting for many people also. But one thing for sure this feature is most talked element of this game. Other than realistic look this his hat is going to be full of a surprise this time. As per the information available, he can now use his cap as a weapon to throw at enemies, and also he can turn it into a platform and jump on it. It seems that hat is going to be a new sentient character itself. There can be many more surprises which are waiting for us in the game. It will accompany the release of a new Nintendo console preferably Switch later this year. The visuals of the game are bright, colorful, and unlike typical Mario. Probably, it is for the first time when Odyssey is making its hero to explore locations outside of Mushroom Kingdom like New Donk City, an analogue of New York. 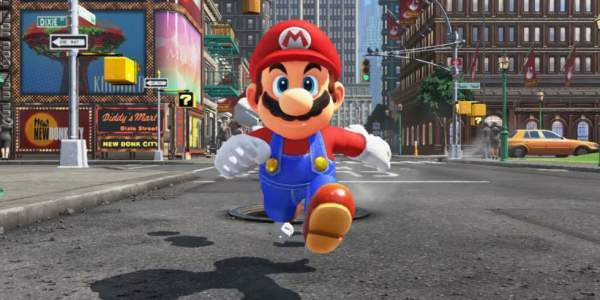 It raised a few eyebrows as Mario is seen walking among the regular humans. However, the other locations offer the same inventive, thematically outlandish designs like Mario worlds. Super Mario Odyssey Release Date: When is it coming out? The best part of all this is that it’s coming out this year during the “holiday season” of 2017. We do not ensure about the exact date of release, but it will be out for Christmas 2017. So, this Christmas is going to be a fantastic one. Also, Amazon US has listed the game for a launch date of December 29, 2017. If it comes out early, it would be a bit of surprise. However, if you remember, Nintendo last year said that a new Mario game would arrive within the six months of Switch launch. The release date is far away, but this won’t stop our retailer from pre-ordering for the new Mario game. This game will cost you around £59.99 and retailer has already started pre-ordering of the game. Players will be able to play in an open world which eventually let them tackle challenges in any order they wish. However, there is still doubt that linear levels will be like the dodo. The mechanics are relatively similar to clever puzzles, precise platforming, and a dash of exploration. As the trailer itself speaks, the players will be able to mount creatures in the world. It will be a single player game, unlike Super Mario 3D World. Super Mario Odyssey Platform: What can I play it on? You will be able to play it only on the Nintendo Switch. Nintendo is forcing its users to shift to its new console. It means that Wii U has been left in the cold especially for this release. SuperMario Odyssey is going to be the biggest blockbuster of this year. Be ready. Stay tuned to The Reporter Times for latest game news and other Entertainment updates round the clock.